Once again, just an arm’s length outside my window–which is an arm’s length from my writing chair–blooms the summer Butterfly Bush. I’ve watched this blossoming, buzzing procession now for nine years, and every year shows a little something I missed the one before. I’ve managed to take some stills in past summers of what I consider the most interesting visitors–the clearwing moths–but this year, I got a very short movie. Years past, I’ve never gotten a good view of the largish insect that seemed mostly about being obnoxious, as I’ve described, flying about and merely knocking the swallowtails, skippers and bumblebees off whatever spray of flowers they were visiting. I suspected there might be predation doing on, because I did find bodyless wings on the ground under the bush. Well, this year, I saw the whole grizzly drama in action from start to finish. 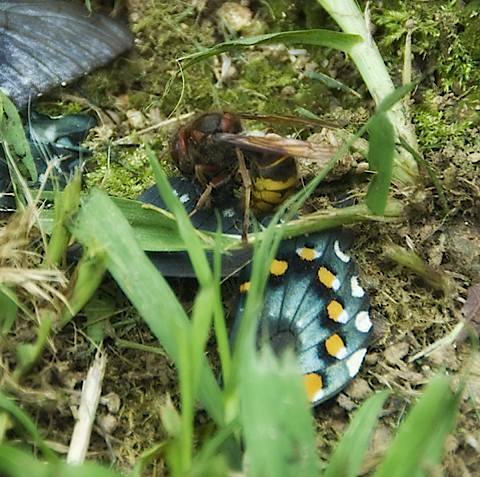 You can see a still shot of the remains of the victim, and the perp: a European Hornet. I watched as first one wing, then another, was dissected from the soft body of the spicebush swallowtail. The insect-feeding species, as the name suggests, is not a native. It was introduced into the US, first reported from New York in 1840. The largest true hornet, it now comes not in ones and twos, not just to bully, but in dozens and to glut on the peaceful visitors to my butterfly bush. I’m starting to get upset and have considered taking a tennis racquet out for biological control of the hornet butterfly killers. Just in the past few days, assaults have gone from one or two to dozens per hour. Sometimes a half dozen brick-and-gold thumb-sized predators will swirl around just outside the glass–so much so that for long periods this year, nothing dares come for the nectar they need to survive. But not to throw stones: more often than not, when a kill is made, part of it is carried up and over the house, back to a nest somewhere on the ridge, to their young. And the outcome isn’t always in favor of the attacker. From what I’ve seen, the success rate of attack versus kill is rather low. I watched one skipper plummet to the ground in the deadly embrace of a hornet. They rolled and writhed for maybe 15 seconds, and the skipper escaped, zipping right back to the flower spray from which it had been feeding when it was nabbed. These hornets are unusual in that that are night-active, and who knows how many times they have been responsible for “things that go bump in the night” when their hard bodies hit the window glass at high speed. Two years ago we had a European Hornet nest near our house and several would find their way into our mudroom daily. I stepped on one barefoot – initially it felt like someone shot me in the toe with a brad nailer (OWW!) but the pain subsided quickly. They are a menace for beekeepers (http://www.youtube.com/watch?v=R_DQYVppJG4). But I understand that Japanese bees and other bee varieties have a neat defense response. When a scout hornet finds the hive, the guards swarm the hornet and completely encase the scout, raising its body temperature to 118F which is beyond the tolerance of the hornet, which dies! Neat! Previous Previous post: How Well Do Your Grandchildren Know You?